In an earlier post this year, I mentioned that most of the returns from my “fun trading account” are due to buying weed/cannabis stocks in the very early days. When I made the purchase a new Prime Minister was elected, and it felt like he would really push for the legalization of cannabis in Canada. In hindsight, it was a great move (my largest percentage winner thus far), but on the other hand, it was a relatively small amount so it didn’t make a large dent in the net worth. I often imagine what it would be like if I had better conviction on cannabis stocks at the time and backed up the truck – however, I digress! The recent boom in cannabis stocks has resulted in lofty valuations (shall I say bubble?). In this case, investors/speculators have high expectations for cannabis sales once it is fully legalized in October. 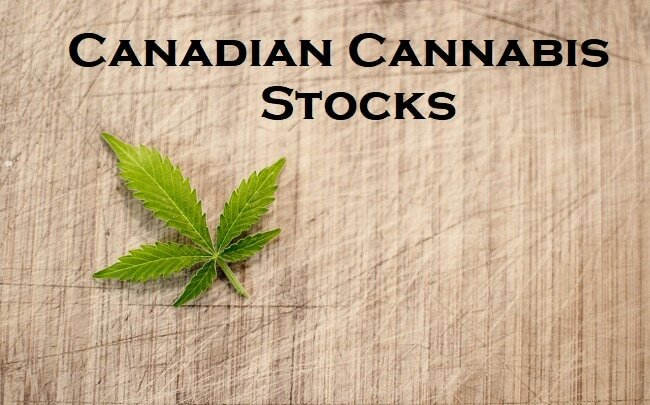 All the hype and market drama has resulted in a number of reader emails about weed stocks, so I thought I would put together a post on the largest weed stocks in Canada. Although most of the “big” players have sales right now, they are very low relative to their market capitalization (what the stock market thinks the company is worth). As a result, investors/speculators are buying based on future sales. Some factors that are considered is the amount of square footage (or future square footage) that is available to grow cannabis. Another big factor that has given a big push to the industry is the alcohol industry teaming up with weed companies to produce new adult beverages. Constellation Brands, the company that makes Corona, recently added to their position in Canopy Growth (the largest cannabis company in Canada). Constellation now owns 38% of Canopy with the option to purchase another large portion that would give it greater than 50% ownership. The last purchase gave Canopy about $5B to play with the side benefit of giving the whole cannabis sector a vote of confidence. Canada has sprinted out of the gates as a leader in the industry on a global scale. Here are the largest weed stocks in Canada. This data below is taken from MorningStar and New Cannabis Ventures. While I think that valuations are lofty, bubbles can last much longer than people expect, so there is a possibility that these stocks simply keep going up with the hype. If you aren’t interested in buying individual stocks, but interested in owning the whole sector, you can buy an index ETF that holds most of the positions that I mentioned above. In my opinion, fun and exciting stocks like the ones in the cannabis sector are for the risk takers, should be just that, for fun. If you have the risk tolerance, then it should be a smaller portion of your portfolio rather than core positions. If you want to play the sector, then trading HMMJ may be a decent bet rather than doing the analysis on all the individual players. Are you invested in any marijuana stocks? If so, which ones are your favorite and why? Disclaimer: This post is for informational purposes only. I hold positions in some of the stocks mentioned. The Best of Million Dollar Journey: 2017 Edition! Much like yourself, I saw the opportunity to invest early after Trudeau was elected. After hearing him promise for the 1000th time I decided to invest heavily. There were numerous stocks within the sector that I cycled through over the last 3-4 years. It’s been a life changer and helped my achieve my millionaire goal. I acknowledge how risky it was and plan on exiting before Oct 17th to be safe. I’ve made enough to be grateful and not greedy. Congrats on the huge net worth growth Sean, especially at such a young age. I look forward to hearing your updates in the years to come! Thanks FT. I plan to make sure my story continues as a positive one. Enjoyed your session in the Canadian Financial Summit! When the announcement for the legalization of weed, I did a bit of research and decided not to invest in the sector from a moral standpoint. I also don’t invest in he cigarettes and gambling sector for the same reason. Great job getting in early FT. Are you thinking of cashing in some of the profits while you are ahead or you’ll let it ride? Namaste is a stock that I invested in a long time ago. They dont grow but they sell online. Everything else but the pot is what they are. I will also exit by Oct 17 as I dont think prices will surge at that time. They will likely retreat. Thanks for sharing. It is a truely intersting industry and investment opportunity and perfect for ‘fun money’. Currous if anyone is worried about the recent US declaration that anyone who invests in marijuana companies could be denied entry to the US. Has this changed your approach? I have heard about this and curious as to how they will enforce it. Will they ask about portfolio holdings at the border? It doesn’t make much sense to me. I have owned several of the mentioned companies for a few years. Than I bought more property and started investing in mmj stocks in 2014/2015, These are the 2 best decisions I have made in my life. Even though I now have more debt than I ever thought I would accumulate, including multiple mortgages, lines of credit and margin account that would make anyone cringe, I bought into another mmj today. This is definitely high risk high reward, but for some reason I see very minimal risk in my strategy, I feel comfortable. I have sped up my rate of reaching financial independence tenfold in the last 4 years. My one problem, knowing when to take profits. It’s good to invest long term, and usually trumps all other types of investing, but I have yet to take any profits. Perhaps I’m being to greedy when others are fearful. The last few years have been a free money market. However, the music will stop eventually. De-lever at the very least. In general stocks are good for long term. But these cannabis plays have come a loooooong way and I think they may take an equally long time to justify their valuations. It’s the flavour of the week for now. But when the momentum ends it will be ugly for a while. Pretty sure everyone is thinking they’ll get out before Oct 17. The valuations are getting silly. I invested on HMMJ and sold some already to recover my capital. Then I bought international ETF which is more stable. As such I don’t worry whatever happens on or after Oct. 17 but will closely watch any changes. I’m educating myself about the pros and cons of weeds as a medicine and only see promising result that I hope could legally help more patients. Previous post: Canadian Financial Summit 2018 – All Online and FREE!